Home Auto Mania EBC makes the “Super” grade but too late? EBC makes the “Super” grade but too late? The motor racing world in Thailand is buzzing with the news that Three Crowns, the promoter of the top echelon of motor racing (Super Car) is withdrawing from the sport in 2013. This category was for the top cars in all classes, and they even had what was called “Super Retro”, a class we were off about three seconds a lap but expected to make that up next year. Two of the regulars in my group are Gavin Charlesworth in the EBC backed V8 BMW E30 and Frank Teeuwin in the B-Quik M3 powered BMW E30, who decided they would put their cars up against the Super Retro cars, and came in 1st (Gavin) and 2nd (Frank). 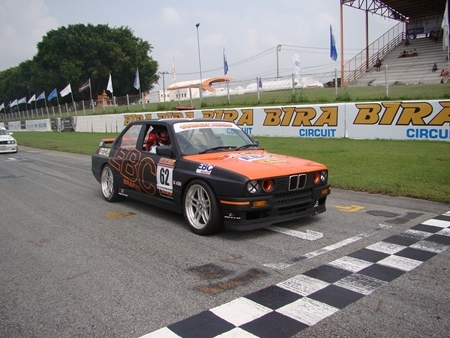 EBC V8 BMW on pole at Bira. Having proved that they have the speed (Gavin down to a 1 min 11 second lap at Bira), they were looking forward to competing in Super Retro next year. Now comes the news that the promoter is pulling out. However, I would fully expect another group to take over the reigns. Watch this space!